brand campaign turns a confusing name into a key asset. The best brands tend to thrive, not because they have a snazzy name or a cool logo, but because they consistently deliver unique, quality products and services. The same is true for Physicians for Peace. For 25 years, the non-profit has been dramatically impacting underserved regions around the world by training local health workers and elevating the level of care available. All of this success came in spite of a name that sometimes caused confusion about their mission. After research indicated that the name had a strong affinity among their donor base, they decided to keep it, and hired 93 Octane to transform it from a liability to an asset. We started with a revised logo that positioned the organization in a more modern light. 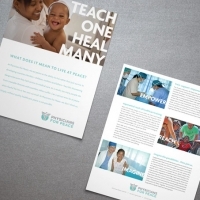 Marketing materials were then developed around the new tagline, “Teach one. 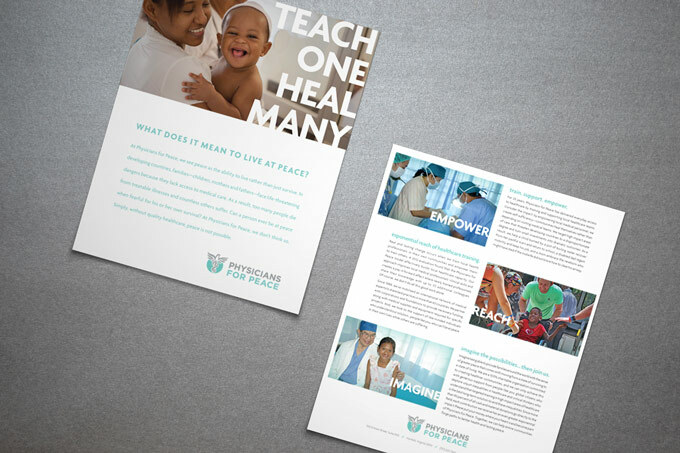 Heal many.” And an introductory flyer further explained their philosophy: peace wasn’t just about the absence of war, but about how quality health care can give people the ability to live rather than just survive. St. Joseph’s Villa branding, logo design, print design.